Your mission, if you wish to accept it, is to read this article without falling asleep. The first Venturer group was attempted in 1976 by our Unit Leader at that time, Jack McCabe. This group did not unfortunately work and closed down faster than it started. In October 1981 the Venturer Section was re-opened with seven Venturers and Frank McGonigle as their Venturer Leader. This group lasted until 1982 when Tommy Kelly took over as Leader with Brian Nevin as Assistant Venturer Leader. When I was researching for this report Tommy gave me a list of people that he remembers took part in this section over the years but if I was to list all of their names I would probably do two things, run out of room or leave somebody out. But what I can say is "Boy did they do a lot of things, and has given me plenty of ideas for our present group". HELLO!!! IS EVERYBODY STILL AWAKE? YEAH! O.K. In July 1983 Venturers were now opened to girls and by September 1983 there was nine boys and three girls in Venturers. 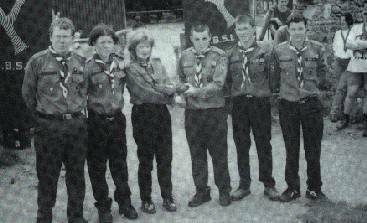 In November 1984 the Venturers were split into two groups. The younger Venturers met on Wednesday nights and the older Venturers met on Saturday night. However this did not last and in July 1985 there was only twelve Venturers and therefore Wednesday night was closed. In 1989 Venturers in the Unit closed but a few times they were tried out time after time but just could not get it off the ground. UHO!!! IS EVERYBODY STILL THERE? YES, O.K. LET'S MOVE ON IF THAT IS ALRIGHT WITH YOU. On the l9th of October, 1996 I took over as Venturer Leader with Betty Guilfoyle and Michael Cunningham ' as my Assistant Venturer Leaders. Since then we took part in the National Orienteering held in April 1997 in Naas which the lads retained the title from last year. On the 4th July we took part in the first ever National Campcraft Competition for Venturers in Larch hill. We competed for the 'Cairde' Trophy which we won. Not only was this a competitive weekend the lads said it was really relaxing and it didn't feel like people were looking at you all weekend. We all go to meet other Venturers from around the country, even though some of them were a bit mad like Aoife from Dublin who liked to introduce herself by rubbing your ears, poor child. After that really exciting weekend another first for St. Paul's Venturers was the Explorer Belt. Two teams of two, Keith Walsh, Damien Fitzgerald and Colin Greaney, Conor Kenny, headed for Slovenia with 23 other teams from around the country. These other teams included three teams from our region, Thomastown, Kilmacow and De La Salle. Next on our agenda was our most recent event which was 'Ventact' in Kilcully Campsite in Cork. And boy what a weekend. It was action packed all the time, mainly on Saturday. We were all giving two activities which included things like canoeing, abseiling, orienteering, rock climbing, horse riding and jet skiing. There was about 500 Venturers from all around the country at this weekend and the buzz was mighty, and we would recommend it to every Venturer. This year '1998' we have gone canoeing with the region in Thomastown. This was a good laugh. We also competed in the Cairde trophy again which was excellent. This year we are also going to Ventact again which should be the best of all. Well that's about it from me and if you have gotten this far and are still awake, I guess you have completed your mission. All I have left to say is that if you have enjoyed reading this article and would be interested in getting. involved in it please contact any of the leaders for more information, because next year we hope to be bigger and better than ever before. And I would like to thank everybody who helped me in researching the history of St. Paul's Venturer Scouts. Copyright © St. Pauls Venturers. Last updated on Saturday, 10 October 1998.